Xcode Life a personal genomics company has launched a free genetic report on Warfarin metabolism. Individuals and healthcare professionals can upload their DNA raw data and download the report within 24 hours. CHENNAI, India, September 23, 2018 – CHENNAI, India, September 22, 2018 (Newswire) – Xcode Life, a global personal genomics company that specializes in providing a variety of health and wellness reports to individuals and healthcare professionals has launched the free Warfarin metabolism report. Individuals/physicians who have their DNA raw data from companies like 23andMe, Ancestry DNA, Family Tree DNA, Living DNA, MyHeritage DNA and other companies, can avail this service for free by uploading the raw data to the Xcode Life website. Warfarin is a common drug that is prescribed to treat blood disorders such as deep vein thrombosis and pulmonary embolism. It is also used to prevent stroke in people who have atrial fibrillation, valvular heart disease or artificial heart valves. In 2007, the US Food and Drug Administration (FDA) mandated that information about the genes CYP2C9 and VKORC1 be included in the labeling information on Warfarin1. In 2010, the FDA updated the drug’s label to include specific dosage recommendations. Genetic testing for Warfarin dosage will look at specific variants in CYP2C9 and VKORC1 genes and deduce the individual’s ability to metabolize the drug1. Between 2005 and 2015 the number of Warfarin prescriptions have ranged between 10-40 million a year. Using genetic reports to prescribe this nearly 60-year-old drug has enhanced its efficacy in the user and reduced hospitalizations due to bleeding complications. This is one of the many efforts from Xcode Life to provide empowering genetic information to individuals and health care professionals. Researchers from the Mayo Clinic presented the results of their study2 that showed a 31 percent reduction in the number of hospitalizations within 6 months of beginning Warfarin therapy in individuals who took genetic testing as compared to those who did not. In addition to this, the study also reported a 28 percent drop in hospital admissions arising due to bleeding complications2. “Between 2005 and 2015 the number of Warfarin prescriptions have ranged between 10-40 million a year. Using genetic reports to prescribe this nearly 60-year-old drug has enhanced its efficacy in the user and reduced hospitalizations due to bleeding complications. This is one of the many efforts from Xcode Life to provide empowering genetic information to individuals and health care professionals,” says Dr. Abdur Rub, Chief Technology Officer, Xcode Life. 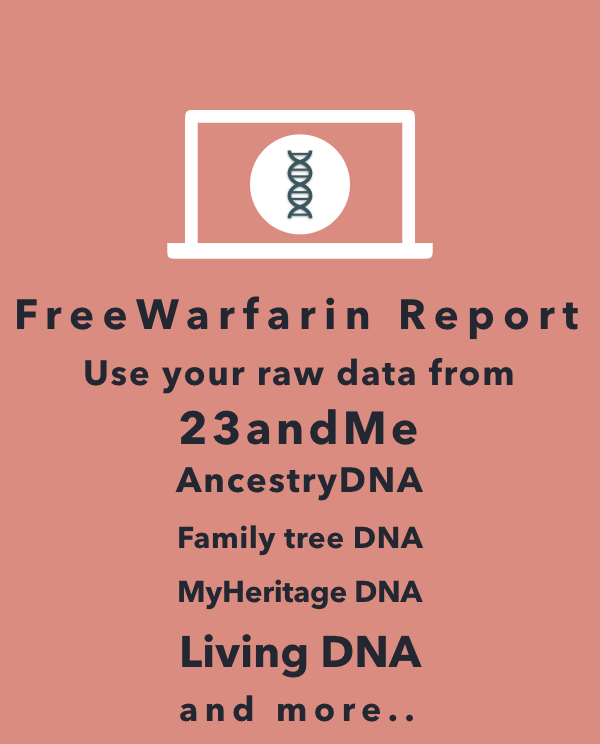 Individuals or health care practitioners, who have their DNA raw data from ancestry genetic companies like 23andMe, Ancestry DNA, Family Tree DNA and other companies, can now upload this data for free and learn about the genetic metabolizer status for Warfarin. The free Warfarin metabolism report is available here. Xcode Life, already provides free reports for FDA approved Alzheimer’s risk markers (APOE gene) and Plavix metabolism. In addition, several paid tools for DNA raw data analysis are also available to users. The provision of free reports towards personalizing medicine for individuals has received an overwhelming response from physicians and individuals. The company will continue to release new free and paid tools based on personal genomics data. Xcode Life was established in 2011 to provide genetic testing and analysis services. Xcode Life specializes in DNA raw data analysis and interpretation providing various reports including Nutrition, Fitness, Health, Skin, Allergy, Carrier Status, BRCA and Breast Cancer, Ancestry, Precision Medicine, Methylation and MTHFR reports. Xcode Life is the only company to accept all types of raw data in any format including genotyping and sequencing files. Visit www.xcode.life for more information. 1. Dean L. Warfarin Therapy and VKORC1 and CYP Genotype. 2012 Mar 8 [Updated 2018 Jun 11]. In: Pratt V, McLeod H, Rubinstein W, et al., editors. Medical Genetics Summaries [Internet]. Bethesda (MD): National Center for Biotechnology Information (US); 2012-. 2. Epstein, Robert S., Thomas P. Moyer, Ronald E. Aubert, Dennis J. Okane, Fang Xia, Robert R. Verbrugge, Brian F. Gage, and J. Russell Teagarden. Warfarin Genotyping Reduces Hospitalization Rates. Journal of the American College of Cardiology 55, no. 25 (2010): 2804-812. doi:10.1016/j.jacc.2010.03.009.